The United States dollar ( sign: $; code: USD; also abbreviated US$ and referred to as the dollar, U.S. dollar, or American dollar) is the official currency of the United States and its territories per the United States Constitution since 1792. In practice, the dollar is divided into 100 smaller cent (¢) units, but is occasionally divided into 1000 mills (₥) for accounting. The circulating paper money consists of Federal Reserve Notes that are denominated in United States dollars ( 12 U.S.C. § 418). Article I, Section 8 of the U.S. Constitution provides that the Congress has the power "To coin money". Laws implementing this power are currently codified at 31 U.S.C. § 5112. Section 5112 prescribes the forms in which the United States dollars should be issued. These coins are both designated in Section 5112 as "legal tender" in payment of debts. The Sacagawea dollar is one example of the copper alloy dollar. The pure silver dollar is known as the American Silver Eagle. Section 5112 also provides for the minting and issuance of other coins, which have values ranging from one cent to 100 dollars. These other coins are more fully described in Coins of the United States dollar. The Constitution provides that "a regular Statement and Account of the Receipts and Expenditures of all public Money shall be published from time to time". That provision of the Constitution is made specific by Section 331 of Title 31 of the United States Code. The sums of money reported in the "Statements" are currently being expressed in U.S. dollars (for example, see the 2009 Financial Report of the United States Government). The U.S. dollar may therefore be described as the unit of account of the United States. Unlike the Spanish milled dollar, the U.S. dollar is based upon a decimal system of values. In addition to the dollar the coinage act officially established monetary units of mill or one-thousandth of a dollar (symbol ₥), cent or one-hundredth of a dollar (symbol ¢), dime or one-tenth of a dollar, and eagle or ten dollars, with prescribed weights and composition of gold, silver, or copper for each. It was proposed in the mid-1800s that one hundred dollars be known as a union, but no union coins were ever struck and only patterns for the $50 half union exist. However, only cents are in everyday use as divisions of the dollar; "dime" is used solely as the name of the coin with the value of 10¢, while "eagle" and "mill" are largely unknown to the general public, though mills are sometimes used in matters of tax levies, and gasoline prices are usually in the form of $X.XX9 per gallon, e.g., $3.599, more commonly written as $3.59​9⁄10. When currently issued in circulating form, denominations equal to or less than a dollar are emitted as U.S. coins while denominations equal to or greater than a dollar are emitted as Federal Reserve notes (with the exception of gold, silver, platinum and palladium coins valued up to $100 as legal tender, but worth far more as bullion). Both one-dollar coins and notes are produced today, although the note form is significantly more common. In the past, "paper money" was occasionally issued in denominations less than a dollar ( fractional currency) and gold coins were issued for circulation up to the value of $20 (known as the " double eagle", discontinued in the 1930s). The term eagle was used in the Coinage Act of 1792 for the denomination of ten dollars, and subsequently was used in naming gold coins. 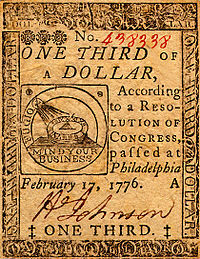 Paper currency less than one dollar in denomination, known as "fractional currency", was also sometimes pejoratively referred to as "shinplasters". In 1854, James Guthrie, then Secretary of the Treasury, proposed creating $100, $50 and $25 gold coins, which were referred to as a "Union", "Half Union", and "Quarter Union",  thus implying a denomination of 1 Union = $100. Today, USD notes are made from cotton fiber paper, unlike most common paper, which is made of wood fiber. U.S. coins are produced by the United States Mint. U.S. dollar banknotes are printed by the Bureau of Engraving and Printing and, since 1914, have been issued by the Federal Reserve. The " large-sized notes" issued before 1928 measured 7.42 by 3.125 inches (188.5 by 79.4 mm); small-sized notes, introduced that year, measure 6.14 by 2.61 by 0.0043 inches (155.96 by 66.29 by 0.11 mm). When the current, smaller sized U.S. currency was introduced it was referred to as Philippine-sized currency because the Philippines had previously adopted the same size for its legal currency, the Philippine peso. In the 16th century, Count Hieronymus Schlick of Bohemia began minting coins known as Joachimstalers, named for Joachimstal, the valley where the silver was mined. The German word for valley is thal, or nowadays usually Tal (cognate with "dale" in English). St. Joachim's Valley is now known as Jáchymov, in the Czech Republic (then part of the Kingdom of Bohemia). Joachimstaler was later shortened to the German Taler, a word that eventually found its way into many languages, including Danish and Swedish as daler, Norwegian as dalar and daler, Dutch as daler or daalder, Ethiopian as talari, Hungarian as tallér, Italian as tallero, and English as dollar. Alternatively, thaler is said to come from the German coin Guldengroschen ("great guilder", being of silver but equal in value to a gold guilder), minted from the silver from Joachimsthal. The leeuwendaler was popular in the Dutch East Indies and in the Dutch North American New Netherland Colony ( Tri-State area), and circulated throughout the Thirteen Colonies during the 17th and early 18th centuries. It was also separately popular throughout Eastern Europe, where it led to the current Romanian and Moldovan currency being called leu (literally "lion"). By analogy with this lion dollar, Spanish pesos – with the same weight and shape as the lion dollar – came to be known as Spanish dollars. 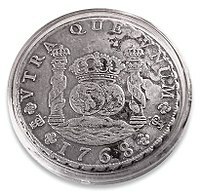 By the mid-18th century, the lion dollar had been replaced by the Spanish dollar, the famous "piece of eight", which was distributed widely in the Spanish colonies in the New World and in the Philippines. Eventually, dollar became the name of the first official American currency. The colloquialism " buck"(s) (much like the British word " quid"(s, pl) for the pound sterling) is often used to refer to dollars of various nations, including the U.S. dollar. This term, dating to the 18th century, may have originated with the colonial leather trade. It may also have originated from a poker term.  " Greenback" is another nickname originally applied specifically to the 19th-century Demand Note dollars created by Abraham Lincoln to finance the costs of the Civil War for the North. The original note was printed in black and green on the back side. It is still used to refer to the U.S. dollar (but not to the dollars of other countries). Other well-known names of the dollar as a whole in denominations include "greenmail", "green" and "dead presidents" (the last because deceased presidents are pictured on most bills). A " grand", sometimes shortened to simply "G", is a common term for the amount of $1,000. The suffix "K" or "k" (from " kilo-") is also commonly used to denote this amount (such as "$10k" to mean $10,000). However, the $1,000 note is no longer in general use. A "large" or "stack", it is usually a reference to a multiple of $1,000 (such as "fifty large" meaning $50,000). The $100 note is nicknamed "Benjamin", "Benji", "Ben", or "Franklin" (after Benjamin Franklin), "C-note" (C being the Roman numeral for 100), "Century note" or "bill" (e.g. "two bills" being $200). The $50 note is occasionally called a "yardstick" or a "grant" (after President Ulysses S. Grant, pictured on the obverse). The $20 note is referred to as a "double sawbuck", "Jackson" (after Andrew Jackson), or "double eagle". The $10 note is referred to as a "sawbuck", "ten-spot" or "Hamilton" (after Alexander Hamilton). The $5 note as "Lincoln", "fin", "fiver" or "five-spot". The infrequently-used $2 note is sometimes called "deuce", "Tom", or "Jefferson" (after Thomas Jefferson). The $1 note as a "single" or "buck". The dollar has also been referred to as a "bone" and "bones" in plural (e.g. "twenty bones" is equal to $20). The newer designs, with portraits displayed in the main body of the obverse (rather than in cameo insets), upon paper color-coded by denomination, are sometimes referred to as "bigface" notes or " Monopoly money".
" Piastre" was the original French word for the U.S. dollar, used for example in the French text of the Louisiana Purchase. Calling the dollar a piastre is still common among the speakers of Cajun French and New England French. Modern French uses dollar for this unit of currency as well. The term is still used as slang for U.S. dollars in the French-speaking Caribbean islands, most notably Haiti. The U.S. dollar was first defined by the Coinage Act of 1792, which specified a "dollar" to be based in the Spanish milled dollar and of 371 grains and 4 sixteenths part of a grain of pure or 416 grains (27.0 g) of standard silver and an "eagle" to be 247 and 4 eighths of a grain or 270 grains (17 g) of gold (again depending on purity). The choice of the value 371 grains arose from Alexander Hamilton's decision to base the new American unit on the average weight of a selection of worn Spanish dollars. Hamilton got the treasury to weigh a sample of Spanish dollars and the average weight came out to be 371 grains. A new Spanish dollar was usually about 377 grains in weight, and so the new U.S. dollar was at a slight discount in relation to the Spanish dollar. The early currency of the United States did not exhibit faces of presidents, as is the custom now;  although today, by law, only the portrait of a deceased individual may appear on United States currency. In fact, the newly formed government was against having portraits of leaders on the currency, a practice compared to the policies of European monarchs. The currency as we know it today did not get the faces they currently have until after the early 20th century; before that "heads" side of coinage used profile faces and striding, seated, and standing figures from Greek and Roman mythology and composite Native Americans. The last coins to be converted to profiles of historic Americans were the dime (1946) and the Dollar (1971). Continental currency depreciated badly during the war, giving rise to the famous phrase "not worth a continental". A primary problem was that monetary policy was not coordinated between Congress and the states, which continued to issue bills of credit. Additionally, neither Congress nor the governments of the several states had the will or the means to retire the bills from circulation through taxation or the sale of bonds. The currency was ultimately replaced by the silver dollar at the rate of 1 silver dollar to 1000 continental dollars. Between 1968 and 1975, a variety of pegs to gold were put in place, eventually culminating in a sudden end, on August 15, 1971, to the convertibility of dollars to gold later dubbed the Nixon Shock. The last peg was $42.22 per ounce[ citation needed] before the U.S. dollar was allowed to freely float on currency markets. The first United States dollar was minted in 1794. Known as the Flowing Hair Dollar, contained 416 grains of "standard silver" (89.25% silver and 10.75% copper), as specified by Section 13  of the Coinage Act of 1792. It was designated by Section 9 of that Act as having "the value of a Spanish milled dollar". The U.S. Constitution provides that Congress shall have the power to "borrow money on the credit of the United States". Congress has exercised that power by authorizing Federal Reserve Banks to issue Federal Reserve Notes. Those notes are "obligations of the United States" and "shall be redeemed in lawful money on demand at the Treasury Department of the United States, in the city of Washington, District of Columbia, or at any Federal Reserve bank". Federal Reserve Notes are designated by law as " legal tender" for the payment of debts. Congress has also authorized the issuance of more than 10 other types of banknotes, including the United States Note  and the Federal Reserve Bank Note. The Federal Reserve Note is the only type that remains in circulation since the 1970s. When the Federal Reserve makes a purchase, it credits the seller's reserve account (with the Federal Reserve). This money is not transferred from any existing funds—it is at this point that the Federal Reserve has created new high-powered money. Commercial banks can freely withdraw in cash any excess reserves from their reserve account at the Federal Reserve. To fulfill those requests, the Federal Reserve places an order for printed money from the U.S. Treasury Department. The Treasury Department in turn sends these requests to the Bureau of Engraving and Printing (to print new dollar bills) and the Bureau of the Mint (to stamp the coins). The decline in the value of the U.S. dollar corresponds to price inflation, which is a rise in the general level of prices of goods and services in an economy over a period of time. A consumer price index (CPI) is a measure estimating the average price of consumer goods and services purchased by households. The United States Consumer Price Index, published by the Bureau of Labor Statistics, is a measure estimating the average price of consumer goods and services in the United States. It reflects inflation as experienced by consumers in their day-to-day living expenses. 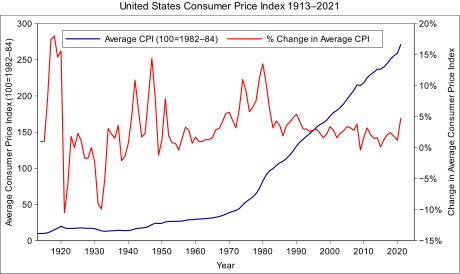 A graph showing the U.S. CPI relative to 1982–1984 and the annual year-over-year change in CPI is shown at right.